One of the main reasons for such a high number of empty driving is that carriers and shippers just don't have information about each other's plans and options. At the same time when a half-empty truck starts driving home from one warehouse, in another warehouse nearby they are looking for a truck to carry their cargo in the same direction. Probability that they learn of each other is close to zero. It's a bit strange that in the era where there are GPS and internet in almost every truck there are no means to share this information with shippers. For quite some time already there are marketplaces for goods like Timocom, Cargo.lt et al. These allow carriers to search for suitable loads and offer their trucks to do the hauling. The problem of such solution is that the logistics guy at the trucking company has to do a lot of manual, low value work to find and analyze the needles in the hay stacks and make bids to get the work. That's why we founded Palleter in Fall 2015. 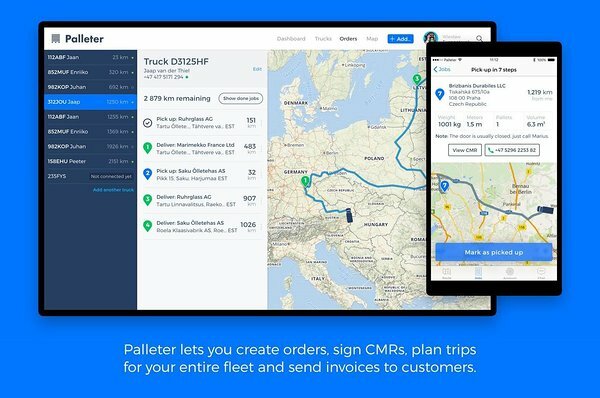 We have built and launched tools for small trucking companies so that their logistics team can manage their existing business — handle orders, sign and exchange CMRs, plan routes and dispatch trucks, create and send invoices to customers. It comes in the form of a free cloud-based service — all your data is kept securely in the servers. It's just like an online bank, only not for money but your documents. You can grant access to your colleagues and work with your account from any internet-connected point in the world. We at Palleter only see the tiny bit of information that you want to share with us — how much empty space you have and where it's headed. Based on that info we can offer you more work, more loads to carry and more money to earn — together with shipping companies. We reverse the tables of online cargo exchange marketplaces — instead of you searching for loads to carry, relevant loads will instead find you. 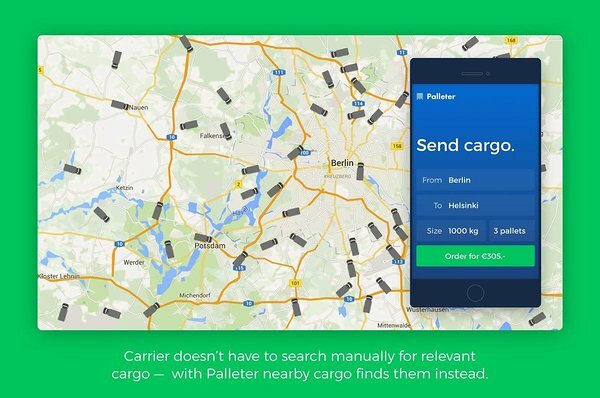 Somewhat even more importantly, Palleter makes life easier also for the truck drivers. They can use our smartphone app which shows them their next task and all the documents attached to it. They can conveniently even sign CMRs right inside their phones and tablets. Also the book keeper gets more organized — all the documents that are needed for creating the invoice are attached together — the order document together with the confirmation by the client, signed CMR and invoice itself are all neatly bundled together and accessible from cloud. They can be sent to the customer with the push of a button and they remain archeived and always accessible for you. Our product has reached piloting phase and is already available in three languages — English, Russian and Estonian. First trucking companies are already using it and giving us valuable feedback on what else needs to be developed, improved or changed. You can sign up right here on our homepage (www.palleter.com) or just drop us a line at info@palleter.com and ask for more info. We see how this approach makes life much easier for small and medium trucking companies over the upcoming years. First through better, more convenient tools, but afterwards also by getting more work and paid faster through the same system.